Fides Report: Kinshasa (Agenzia Fides) - At least 10 priests and two nuns were kidnapped by the police in the clashes which occurred yesterday, Sunday, January 21, in several cities of the Democratic Republic of Congo, due to the violent repression of a new protest initiative promoted by Catholic laity. "We are aware of the fact that ten priests were arrested, including Fr. Dieudonné Mukinayi, of the parish of Saint Christophe de Binza Ozone. He was kidnapped along with eight parishioners", said Georges Kapiamba, President of the Association Congolaise pour l'Accès à la Justice (ACAJ), according to which two religious sisters have also been kidnapped. "The arrested priests could even be 12 in addition to the two nuns", sources from the Congolese Church told Agenzia Fides. "Unlike December 31, this time the protests affected many cities throughout the DRC" say our sources. "In the capital, Kinshasa, from where it was launched, the call for demonstration was accepted in all the municipalities. In Goma (the capital of North Kivu), where on 31 December the call for demonstration had not been re-launched at a local level, this time instead a demonstration took place after Mass in the cathedral, which was repressed by the police. In the capital of South Kivu, Bukavu, the police stopped the protest by preventing people from gathering. In Mbuji-Mayi, capital of Eastern Kasai, churches had been surrounded by the military since the early morning. The local Bishop had to publish a statement to ask priests to have the courage to carry out religious services. But in the cathedral of Mbuji-Mayi the military interrupted the Mass, preventing the consecration of the Eucharist" say Fides sources. "5 people have died so far, but the number could be higher, maybe 6 or 7. Among these there is the daughter of a police officer who died simply to protect some girls when the military started shooting in the parish of Saint Kizito in Kinshasa". The provisional toll of the repression presented by MONUSCO (UN Mission in the DRC) is 6 dead, 57 injured and more than 100 people arrested. Yesterday's demonstration was also called by the Catholic laity to exert pressure on President Joseph Kabila to respect the New Year's Eve Agreements of December 31, 2016 and above all to obtain from him the solemn commitment not to run as a candidate at the December 23, 2018 elections. AFRICA/DR CONGO - "Protests led by the Catholic laity will continue"; the Nunciature: "fatal bullets fired against demonstrators"
Kinshasa (Agenzia Fides) - "The government is trying to put the blame on the organizers regarding the violent protest march held on Sunday", report Church sources of the Democratic Republic of Congo to Agenzia Fides, where on Sunday 21st January in several cities of the country law enforcement officers fired teargas to disperse demonstrations organized by the Lay Coordination Committee of the DRC against the continued rule of President Joseph Kabila. The protest was the latest in a series since Kabila refused to step down at the end of his mandate in December 2016. Despite the repression, the Catholic laity will not surrender, because as reported by Fides sources "they want to organize other demonstrations". "This is because - explain the sources - we now have the distinct impression that those in power do not want to leave. Demonstrations therefore remain the only form of protest, albeit weak, to put pressure and hope that something changes within the presidential regime". "Nothing is known about the ten priests arrested on Sunday, January 21" our sources say. "We only know that one of the arrested priests has been accused of attempted aggression by a minister because in order to escape the firing of tear gas by the police, the priest along with other people, took refuge in a house, which belongs to the minister in question. The minister then accused the priest and the people who were trying to attack him, but it is a false version". 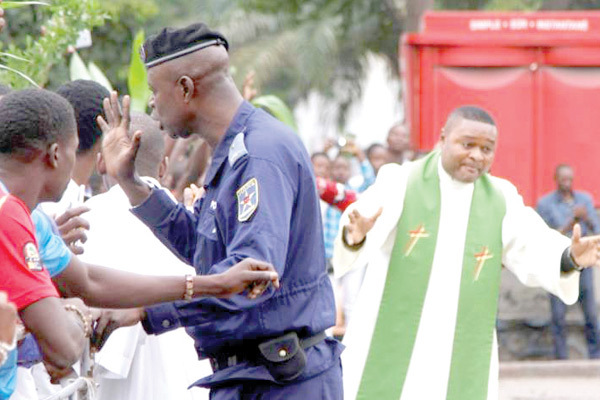 "In conclusion, the Catholic laity led the protest against Kabila. Several parish priests joined the protest initiatives. It is important to reiterate that the initiatives were taken by the laity and not by CENCO (National Episcopal Conference of the Congo) or by individual Bishops", the sources conclude. In a "Technical Note", the Apostolic Nunciature in Kinshasa confirms that the police fired real, potentially fatal bullets against demonstrators in the capital Kinshasa, and in the cities of Kisangani (north-east), Goma and Bukavu (North and South Kivu, in the east), Lubumbashi (south-east) and Mbuji-Mayi (center). In the note titled "Parishes disturbed by the police" the police are accused of having surrounded the churches and of firing tear gas and real bullets.